Further Information: Dress in Green, If you have one, wear the “Lyme is Here (Map of Australia)” T- shirt and join us for a walk around Centennial Park to represent a message of hope for Lyme disease in Australia. ACTIVITIES ON THE DAY: you can join in some or all of the following: Meet n Greet ; Picture of Hope (Group Photo) ; 3.5 KM WALK - This is a 3.5 km wheel chair friendly walk around Grand Drive Centennial Park- if you can't walk it all, you will be able to walk part of it, or you might like to get hold of a wheelchair or just come to the meet n greet and participate in the group photo at the start point. You can stay and cheer on the walkers too! If you hope for a better future for Lyme disease then you are invited and you are very welcome to come along! $5.00 per person. 17yrs and under Free. Pay on the day – Monies raised over the application cost will be donated towards Lyme disease! 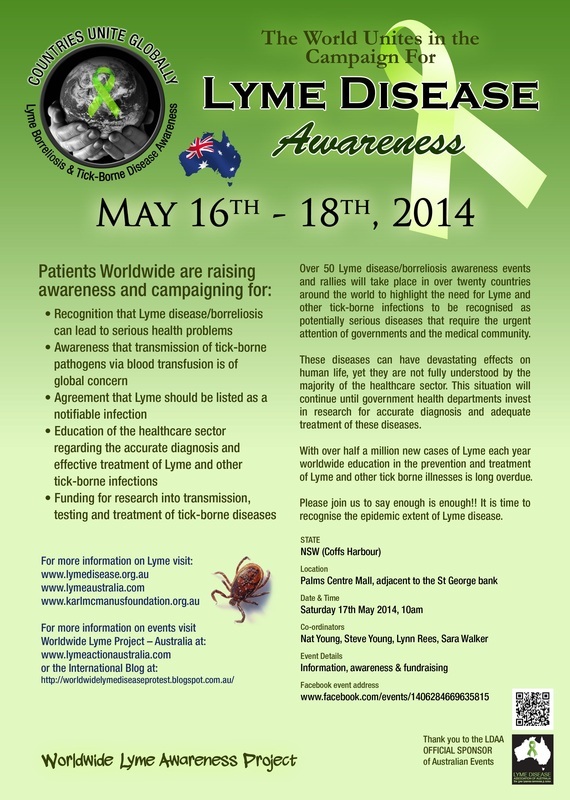 Further Information: Bega event will be a public screening of Under Our Skin documentary on Lyme disease. A short story (‘I am Sophie’ - http://youtu.be/yE7XywbVXfE ) of a local child, affected since birth, with Lyme disease will also be shown: A light supper will be served. Brochures about Lyme disease will be available for attendees.